Tagged with #StandupDontBeCounted, ELT, international students, Net migration, UK. Students, business leaders, academics and politicians opposing the UK government’s policy of including international students in migration figures joined a demonstration organised by pro-London lobby group, London First, and English UK. Rally organisers also released a letter signed by Mayor of London, Sadiq Khan, among others, supporting their aims. Attendees gathered in Torrington Square, outside the University of London’s Birkbeck College, spreading the hashtag #StandupDontBeCounted on social media. 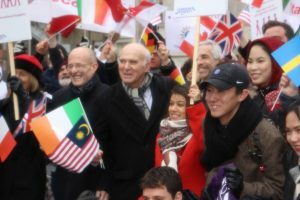 Speaking to The PIE News leader of Liberal Democrats Vince Cable said that current policy is deterring students from India, Pakistan and West Africa. He remarked that “limited” abuse had inspired the current policy, but that it happened in relatively unregulated colleges. Labour MP for Hampstead and Kilburn, Tulip Siddiq told The PIE that it “doesn’t make sense” to include international students or refugees in a net migration target, adding that the government policy was “one of the worst” it has implemented. “We should have our doors open to international students,” she said. Co-leader of the Green Party, Jonathan Bartley, said that including international students in migration statistics was “absolutely absurd” and that May was being held hostage by the right-wing of her Conservative party. “Including international students in those statistics, saying you want to cap them, makes no economic sense. It drives people away from the country,” he added. Rally organisers also released a letter signed by Mayor of London, Sadiq Khan, NUS international officer, Yinbo Yu and Shakira Martin, and London First CEO, Jasmine Whitbread, among others to call the prime minister to change her mind on the issue. Mark Rendell, chair of English UK London, said the migration issue was the biggest the industry needs to overcome but overwhelming support was making it difficult for the prime minister to maintain her position. “[Approaching Brexit] we need our strong industries to be firing on all cylinders. “In the English language sector we are world leaders, and we want to remain world leaders and that’s only possible with government support,” he related.